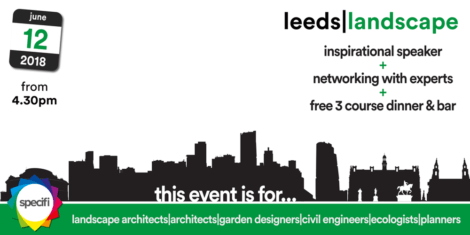 A FREE event for landscape specifiers (you better be quick – there are understandably only a handful of tickets left), the fourth Specifi Landscape Leeds evening event will be attended by over 100 professionals from the landscape design fraternity . Key speaker Joe Clancy will share his thoughts on: “Biophilic Environments:Bridging the Divide; Biophilia and Biophilic Design is the sustainability buzz of the moment, but what is it and how can landscape architects work with other designers to create truly healthy buildings?”. Following its ever-successful format, the event will feature exhibitors, break-outs for networking, a dinner and bar, and an informal chance to rub shoulders and talk “built environment” with those at the forefront in the industry. Let’s connect – book your place now.